Hey look, a new feature! 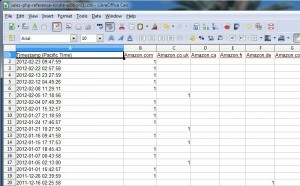 Added by request (thanks Tom from Greece), there is a new CSV export option available for you. 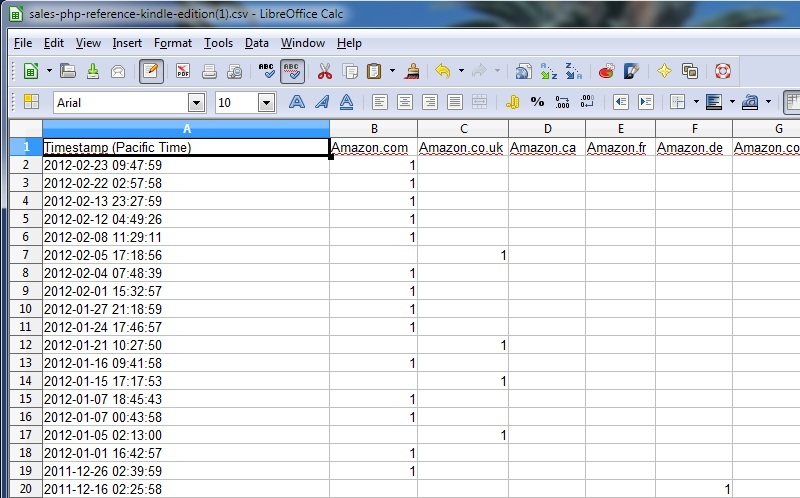 When you are viewing a book’s detail page, you can use the button at the top to expand the Export to Excel/CSV options. From there you will see a new link that will start the download of a single CSV file that contains the date, hour, and day of the week (screenshot is an early version) of every sale since tracking began. It’s sorted by newest dates first, but the date is in a standardized format which will allow you to sort the spreadsheet in the opposite direction using your spreadsheet program. Previously, this data was only available through the charts and only for recent sales (for visibility), so this new feature provides a lot of functionality for quickly analyzing sales estimate data on your own. Finally, all CSV exports have been improved to support the newest domains on NovelRank: Italy, Spain, and China. Apparently, nobody noticed that these were not being exported. Don’t worry though, I noticed, and it is now fixed! This entry was posted in News and tagged csv, export on March 2, 2012 by Mario Lurig.